Hybrid Dogs are more popular than ever. Although the mixing of breeds has taken place since the beginning of dogs themselves, the careful mixing of certain breeds has become almost an art form. Are Pugs a part of this? Absolutely! How could they not be? They are extremely cute, intelligent and have a great personality. We may be a little bit biased but the Pug would be an improvement over whatever other breed it was mixed with! For the record, we are not proponents of the hybrid dog concept, sometimes called Designer Dogs. We think Pugs are perfect the way they are. But, because of the size of this area of dog breeding, it wouldn’t make sense not to address it. In fact, dog owners have created more than 370 breeds of mixed dogs with specific characteristics from a blend of two purebred dogs. To put that number into context, the American Kennel Club has recognized less than 200 breeds. Some people claim that the resulting mix of dog is superior because of what is called hybrid vigor. The claim of this theory is that the mixed breed actually has less genetic defects than the pure breed. This goes back to genetic theory and, since we didn’t fully comprehend all of the theories developed by the Austrian monk Gregor Mendel the first time around in high school biology, there is no way we are going expand on those theories here to expose our ignorance. There are books written on this and some of them, like Dogs By Design by Ilene Hockberg, are quite readable and very interesting. The premise is that constantly breeding a certain breed of dog with the same breed will possibly keep the genetic defects that are common within the breed prevalent in the offspring. Where crossing that breed with another will bring out the best of both. We’re not sure why it would not bring out the worst of both but then, as we said, we are not real fans of mixing a Pug with any other breed. It would be like mixing a fine wine with a less than optimum vintage. True, you have upgraded one but you have diluted the other. Please do not let our perspective put a damper on your search for a Pug hybrid dog. Pugs are adorable and to see their features mixed with another breed of dog can create a wonderful looking creature. Puggles are one of the most popular hybrid dogs and they actually account for about half of the crossbreeds in this country. A Puggle is a cross between the Pug and a Beagle. The Pug Mix is a very popular one. 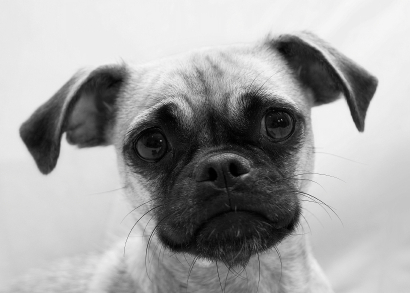 Another popular mixed breed is the Chug which is a cross between the Pug and the Chihuahua (see the picture on this page). But there are many others.